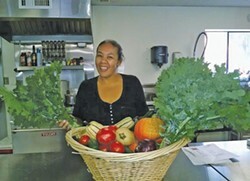 Meagen Baldy hosts an alternative cooking class at the K'ima:w Diabetes Clinic. Watch a few of Meagen Baldy's cooking videos and you might just think you've found a new best friend. Approachable, spunky and down to earth, she films Cooking Healthy in Indian Country in her own kitchen. Her show airs on the Access Humboldt TV network and has hundreds of followers on YouTube. A Hoopa tribal member and the oldest daughter in a family of six children, Baldy started cooking when she was 8 years old. "My dad was a single father and he was like, 'OK, I really need your help.' We were a very poverty stricken family," she says. "My goal was making sure my brothers and sisters were fed." These days, Baldy wants her family to eat well, but she wants to teach her community about healthy eating, too. Diabetes, heart disease and low iron and calcium counts are rampant in the native population. She aims to change that by encouraging her people to improve their diet using locally sourced, affordable and accessible ingredients. In her recipes, Baldy integrates Hoopa food commodities and in-season fruits and vegetables from local farms and the community garden. She even alerts viewers when certain ingredients are on sale at the only grocery store in town. "I think one of the misconceptions of eating healthy is 'Oh, I have to get some exotic, expensive food from somewhere I don't know,'" she says. Baldy wants folks to know healthy food is available in their own backyards. In her role as community garden manager and cooking instructor for the Klamath Trinity Resource Conservation District (KTRCD), Baldy noticed people consistently failed to pick up their veggie club food shares. She eventually discovered why: "People didn't know how to use what they were getting." Things like kale, collard greens and bok choy were unfamiliar and mystifying. Baldy admits that at first even she didn't know what to do with some of the stuff. So she decided to find out. On a whim she photographed a newly discovered kale and egg dish and posted it online. "A lot of our people here have social media," she explains. The community response was great, and from there, her project took off. "I started out filming on my cell phone. I had an elk horn hair stick and a little basket and that was my prongs to hold up my camera." She laughs, saying, "I kinda injun'-rigged up a little device to accomplish the first filming." Eventually, she launched a Go Fund Me campaign to buy a video camera and tripod, and then KTRCD gave her a laptop for editing. Her project is supported by KTRCD, the Hoopa Valley Tribe and the Hoopa Food Distribution Center. Baldy's enthusiasm is infectious. Thus, her four kids are wild about kale smoothies. Even her veggie-resistant husband is on board, though it took a little convincing. "Never deny the power of bacon," she asserts, detailing her cunning strategy of slowly introducing vegetables by hiding them in his favorite meaty dishes. It's not for nothing she's nicknamed "Queen of Kale." Over the years, Baldy has taken food safety and training courses, but says her knowledge of cooking comes primarily from life experience. "I've always been in the kitchen. I love food. I really love food. It's my favorite thing in the world." Baldy hopes to expand her project throughout Humboldt County by collaborating with more producers, farmers and craftspeople. She welcomes community input, and encourages viewers to contribute ideas or recipes by messaging her on the Cooking Healthy in Indian Country Facebook page. In her videos, Baldy butchers mule deer and slices strawberries, fires up her Ninja blender and fries squash at high temperatures. Periodically, one of her boys leans into view with a zealous grin. In a particularly memorable scene she declares, "The eggplant is a misunderstood fruit," foisting it at the camera for close inspection. Then, cradling it carefully in her hands, she explains the importance of leaving the peel intact, as the vitamins are in the skin. She's sure to thank the local farmer who gave it to her. Baldy found this one on Health.com, but you can watch her whip it up on YouTube. Preheat the oven to 400 F. Peel, seed and cut the butternut squash into 1-inch chunks. Toss them with the olive oil, brown sugar, salt and pepper. Bake the mixture for 25 minutes. Remove it from the oven and let it cool. Toss the squash with the kale, cucumber and red onion. In a blender, purée the low-sodium soy sauce, lime juice, sesame oil, sugar, peanut butter, ginger and water. Drizzle the dressing over the vegetables and serve.